Finished carving two woodblocks today inspired by a 900 year old Sicilian legend which I particularly love as it encapsulates so many aspects of this island that I love, the many layers of multi-cultural history, the passion and the endless element of surprise. There are several versions, but this is my favourite, as it’s set in Palermo! One day, a beautiful and honorable young girl living in the Kalsa, the Arabic district of Palermo, was tending to the plants and flowers in the balcony when suddenly, a Moor merchant who was passing by saw her and fell in love with the beautiful girl who immediately returned his love. They started having a love affair until one day she discovered he had a wife and children waiting for him in his native land. She was overcome with jealousy and one night she thought of a way to make him stay with her forever……while he was sleeping, she cut off his head and cleverly decided to use it as a vase to grow her beautiful basil plant. People walking below her balcony started looking at her flourishing basil plants and became jealous of the size and fragrance of her plants, so they began to forge colourful clay heads pots wishing to have the same magic green thumb. Now, these ceramic heads can be seen all over Sicily, in all shapes and sizes. I’ve been thinking about creating some prints of slippers for some time now and jumped at the opportunity to create my first “pair” to commemorate 125 years of women’s suffrage in New Zealand, using one of my favourite sayings and to honour all the women who have had to fight for equality, and still are. The opening night was a real thrill, as my jacket sold even before it got off the catwalk! Got to try it on briefly before handing it over to its happy new owner. Thanks to the wonderful vision and talent of curator Colleen Pugh, this show raised $1,300 for Women’s Refuge. This fantastic collaborative project, curated by Celia Walker and Toni Hartill, brought together 7 print artists from Auckland and Pukekohe High School to create a large-scale print installation of native trees and invasive weeds, complete with real native seedlings that visitors could take home and plant in their garden. The exhibition has had a lot of positive feedback and future venues to exhibit already in the pipeline. Toni Hartill’s stunning moth plant is featured on the cover of the Australia Print Council imprint magazine (Spring 2018) with a 5-page article written by Celia Walker. Its a real buzz seeing kids creating art – their enthusiasm for creating is contagious! I’ve been lucky enough to have the opportunity to do a few workshops out at Corbans Estate Arts Centre this year. You should definitely check out their programs if you have a little budding artist in the family! It was a pleasure to be invited by Mint Gallery in Whitianga to do a weekend workshop with the wonderful creatives there. Some gorgeous prints were produced in just a few hours and there was such a lovely range of styles and imagery. Thanks to PCANZ (Print Council NZ) for hiring out their press, it meant we could make multiple prints in a short amount of time. Looking forward to going back! Finished board that makes up a larger 12 piece board to be printed with a steam roller at Te Kowhai Print Studios, Whangarei! Awesome project to bring our printmaking community together and make something BIG!! Colab pieces are always a great opportunity to explore new subject matter, so enjoyed carving this beautiful native dragonfly. 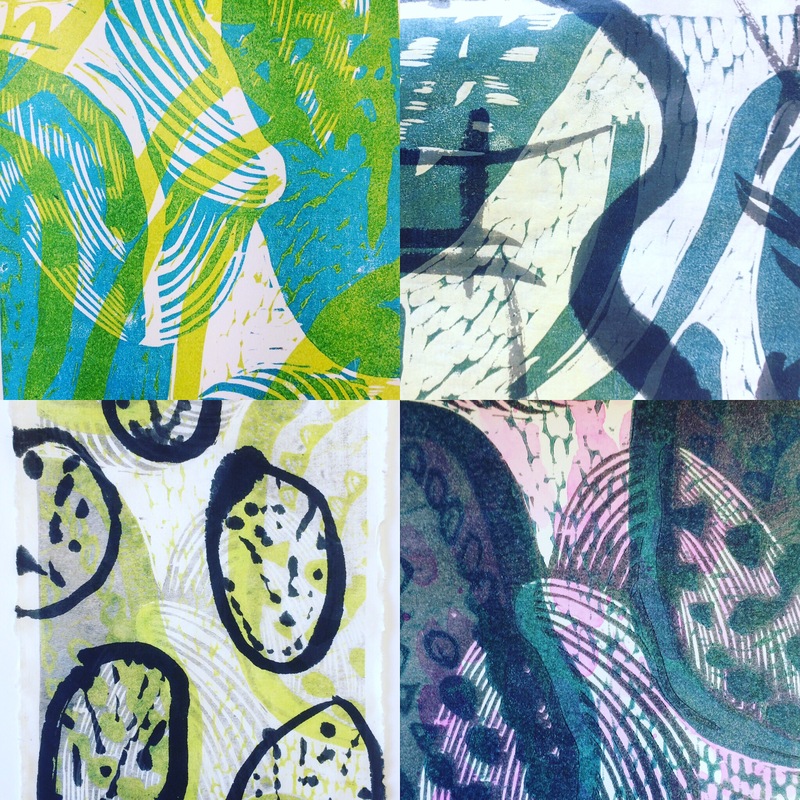 Had a wonderful weekend exploring possibilities with layering woodblock plates to make colorful textured images. Our tutor, Gary Shinfield, shared his practice with us, using Indian inks on thin Japanese paper to free-sketch a reduction of a landscape, we then pasted it onto a thin pice of maple wood ply before carving it out. We also etched Lino using wax with caustic soda which gave a fantastic finish and opened the door for many exciting directions in future explorations with etching……watch this space! December 1st – 3rd is the Art Plus Festival; a fundraising event for Birkenhead Primary School, where my work Kete (below) will be for sale alongside other artists from across the country, as well as workshops, entertainment, and a cocktail gala opening night! Fantastic event to check out if you’re in Auckland that weekend.